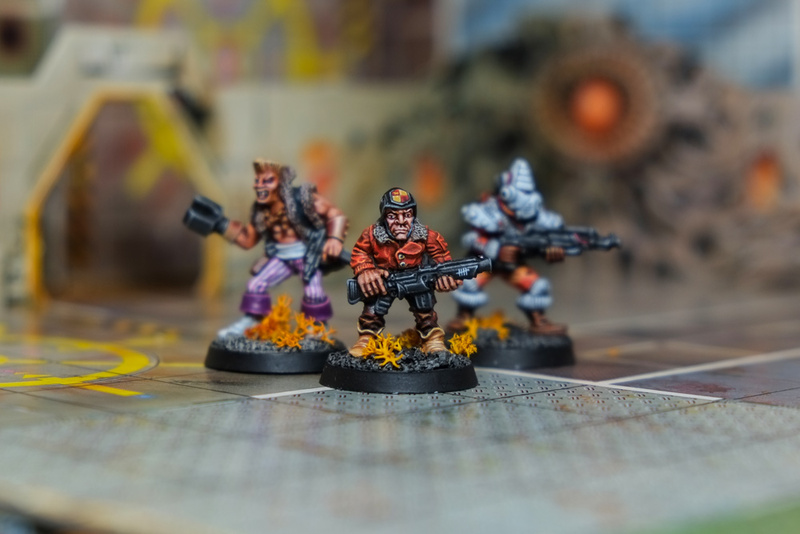 Having painted two Space Pirates, Paradox Zeeman and Nebuli Tsar, for Choose Your Own Adventurers, I wanted to grow my pirate gang. 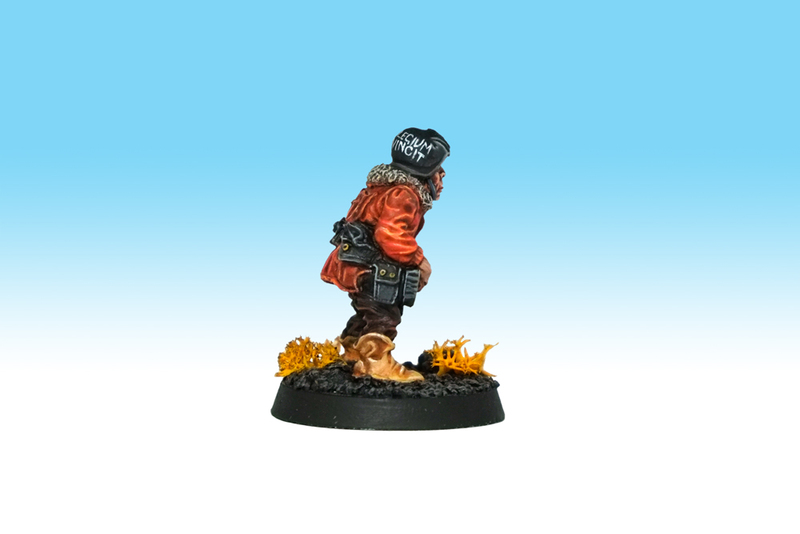 Here’s Trooper Altryn Greymore, otherwise known as Banzai Jones from the Ironclaw Space Pirate range. He was a lot of fun to paint – as with all Ironclaw figures it features Bob Olley’s hypnotically flowing cloth details, texture switching (look at the how the cuffs vary from the sleeves) and pronounced facial features. 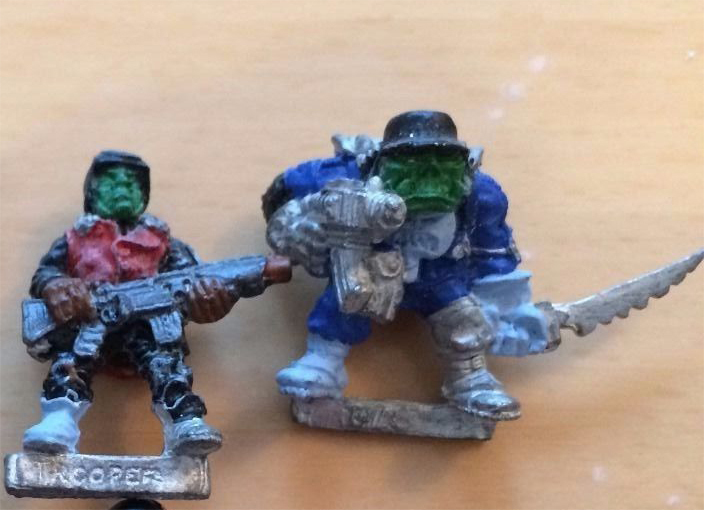 What turns a lot of people off these figures is they’re not recognisably 40K – the weapon, armour and equipment designs only appear in the IC301 Space Pirate and IC501 Squat ranges, and didn’t get absorbed into the main 40K universe design. Bomber jackets with fur collars were issued to aviation pilots to keep them warm before the invention of pressurised cockpits, so the figure looks very twentieth century. 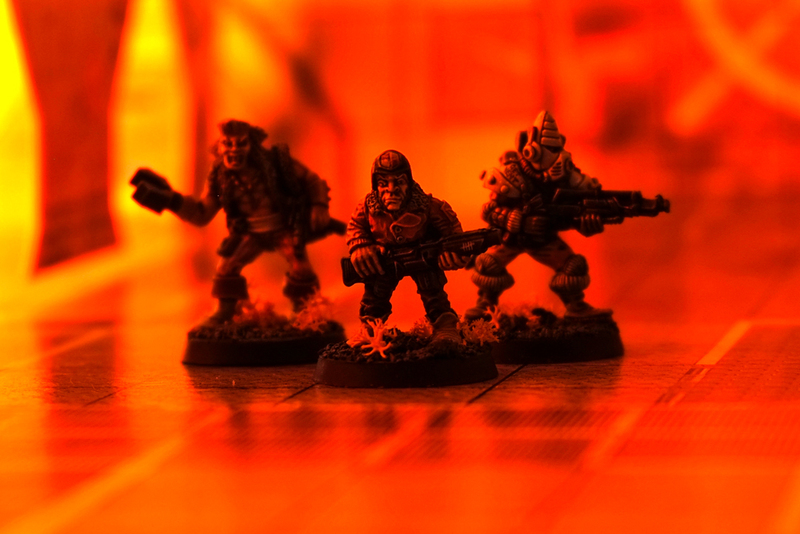 The range is a real curiosity from a time before Rogue Trader coalesced into a coherent universe, and that only helps the Space Pirates look of being exotic outsiders on the fringe of the known universe. Ironclaw IC301 range from the Book of the Astronomican. I reckon it was this unrecognisability, and perhaps Bob Olley’s trademark flared monkey-nostril sculpting that made Altryn’s previous owner paint him green and call him a Space Ork. Consequently he was a bargain. I did originally plan to paint the bomber jacket in black-and-orange camo, but after all the highlighting the orange there was enough visual interest. I still fancied some freehand so I did Vietnam-style helmet graffiti. His helmet has a quartered design sculpted on, which I painted with my old school crest – the red and yellow tying to the autumnal palette. The graffiti is an adaptation of the school motto “LABOR OMNIA VINCIT” (work conquers all), reading “PRIVLEGIUM OMNIA VINCIT” (privilege conquers all), which more accurately reflects how our education system works. 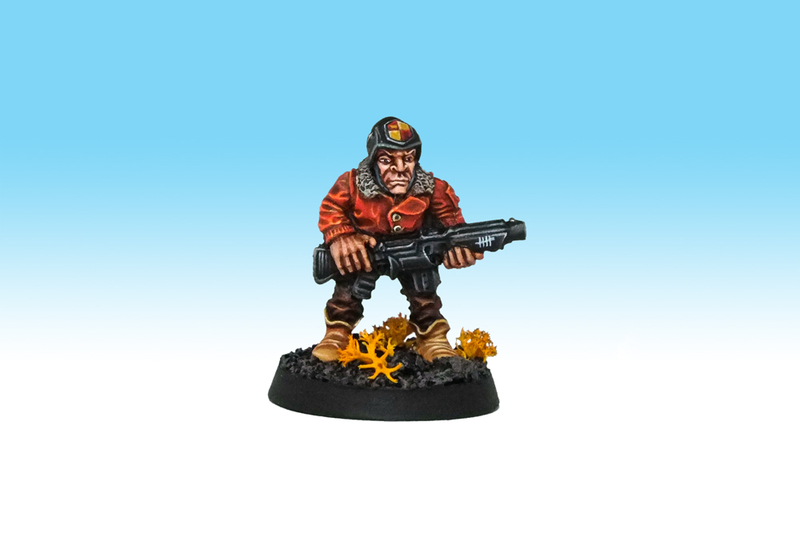 The Claw Nebula Pirates are off to play Shadow War Armageddon with the lads this weekend – I just need to decide what his gun actually is. They’re using the Astra Militarum list. Three models is enough for a legal Killteam, but they’ll be reinforced by my Godbreak 84th, and anything I get painted before Thursday. Zeeman’s crew aboard the Argenteum Cocleare. Fabulous painting on that lovable old svulpt. I can’t wait to see that fig in hand. The shoes are unusual, but they were fun to paint, which is something you don’t normally get to say about shoes. Very nice work here Curis! 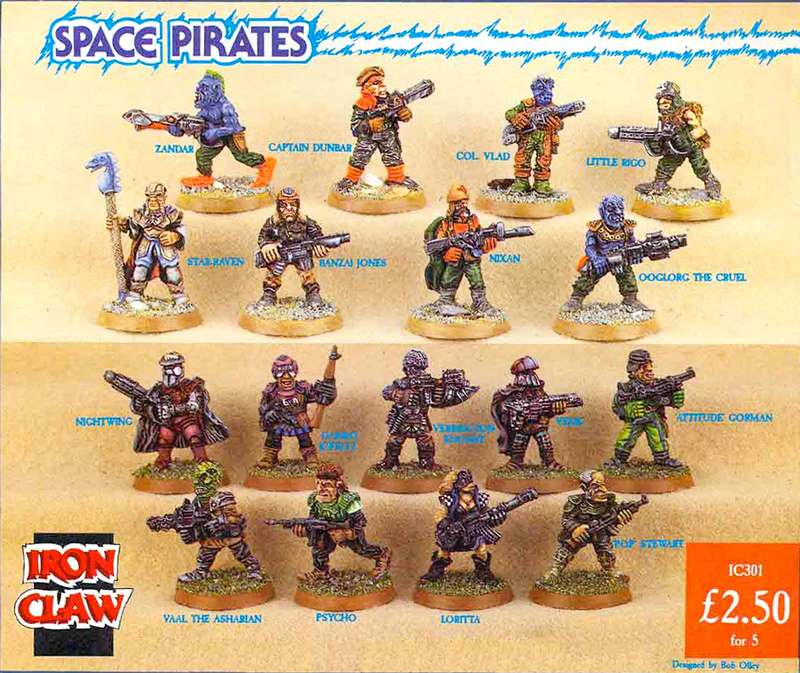 I know those Space Pirates don’t get a lot of love, but between you and Lopez paint work on them….I think you guys are opening some eyes to the possibilities with them. Lopez? Is this the guy you’re talking about? http://heofthreenames.blogspot.co.uk/ I can’t wait to see his stuff once it’s been restored after the Photobucket destruction. I mentioned this to JB a couple of years ago, but I think half the reason that Bob’s minis didn’t fair too well was partly due to their studio paint jobs. They just don’t look that interesting in the photo’s. I say this because every time I come across “modern” painted up versions of his minis they look fantastic. True, this is partly due to the people who paint them today weren’t under pressure to get them ready for a photo shoot. But I kinda get the feeling that his minis weren’t supported or promoted well enough back inn the day. Whatever the reason, at least were finally seeing painted examples of his minis nowadays that do his sculpts justice. Good stuff and great to see you bring him alive. Never been a fan of the majority of Olley’s stuff. It’s the heads, see. They all look the same. The Ogryns, Orks, Squats and Humans have that same bulbous monkey head!